"You wanna go to a chocolate tasting evening at Coco Chocolate? ", my friend asks casually. "CHOCOLATE TASTING?? ", I ask excitedly. "Ya. ", replies my friend as casually. "DO I WANT TO GO TO A CHOCOLATE TASTING??!! ", I scream super excitedly. "Yes! ", replies my friend starting to get impatient. "HELL YES I WANT TO GO!! ", I reply jumping up and down, clapping my hands together. 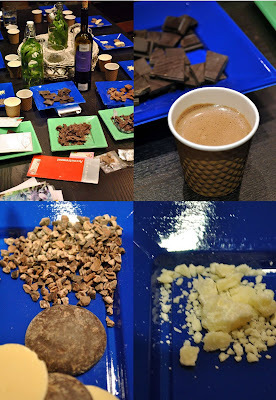 And it was almost two months after we had this conversation that we finally step into Coco Chocolate in Kirribilli for a chocolate connoisseur tasting evening. 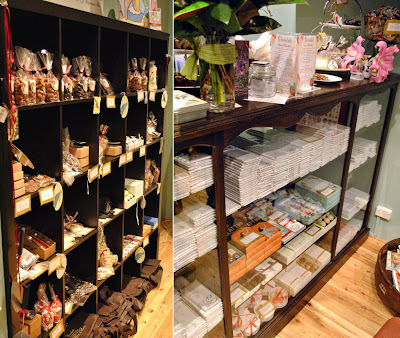 The owner of Coco Chocolate, Rebecca greets us friendly and I tell her I feel like I have just stepped into her home: there's shelves full of chocolate, beautiful interior, the cutest little fridge in the corner and the Chocolat soundtrack softly playing in the background. There is a small group of us attending tonight's tasting and we sit around a table covered with different looking pieces of chocolate. Rebecca starts by telling us a bit about how everything started: she had studied product design in Sydney, but was considering of specialising on either olive oil or chocolate. After realising the options with olive oil would be quite limited, she decided to study the art of chocolate making a bit further and attended a course in France. Rebecca offers us some of her beautiful dark hot chocolate and continues to tell us about how her first shop got opened 6 years ago in Edinburg Scotland (and it is still going strong), how she decided to move back to Sydney after having her two children, and she then moves on to tell us all we need to know about the process of making chocolate. We have a tasting plate in front of us and we start of by nibbling some of the unrefined cocoa. To our surprise it doesn't really have much taste. Rebecca tells us how important it is to handle the coco beans correctly to get the maximum flavour. How the beans are treated and how they are dried affects the amount of sugar that needs to be added in the later processing. The better the treatment, the less sugar needs to be added in because the beans have a much fuller taste. We move on to try some of the cocoa butter that is also on our plate. We rub some of the butter on to our lips and it probably works better that way because eating it feels a bit like eating lip balm. This is, however, one of the two main ingredients in making REAL chocolate because only the real good quality chocolate has 100% cocoa butter instead of cheap vegetable oil. We also get to try the 100% cocoa butter white chocolate, 37% cocoa milk chocolate and 55% cocoa dark chocolate. Rebecca tells us more about the processing of chocolate and the correct way of conching and tempering the chocolate makes all the difference. We learn that there are five main things to look at when tasting good chocolate: 1) the tempering has been made correctly which has resulted in a glossy finish, 2) the chocolate snaps when you break it which means it has the real cocoa butter instead of vegetable oil, 3) there shouldn't any grain left when you let the chocolate melt in your mouth (this means the conching has been made correctly to reduce the particle size), 4) it melts in your mouth which also indicates the use of real cocoa butter, and 5) it smells fresh and rich. Comparison between the famous Lindt (70% cocoa) and the Coco Chocolate's 72% cocoa dark chocolate. Although I am a fan of Lindt, I must say Coco's chocolate tastes much creamier. Apparently the best wine to have with the chocolate is a French red wine called Mas Amiel, which in Australia is only sold in Melbourne for about $80 a bottle. I quickly make a note to let my brother, who lives in France, get me some from his local bottler. Mas Amiel goes beautifully with the Madagascar chocolate bringing out the raspberry-like flavours. The Caribbean chocolate tastes more oaky and hazelnutty. We also sample some of the chilli chocolate, the rose & black pepper chocolate and the white chocolate with raspberry. The chilli chocolate definitely has a kick to it and my friend is excited because she thinks other chilli chocolates don't have enough chilli to really taste it. The rose & black pepper chocolate has a sweet rose smell to it, and the white chocolate with raspberry is possibly the only white chocolate I could ever eat because usually I'm not a fan of this. 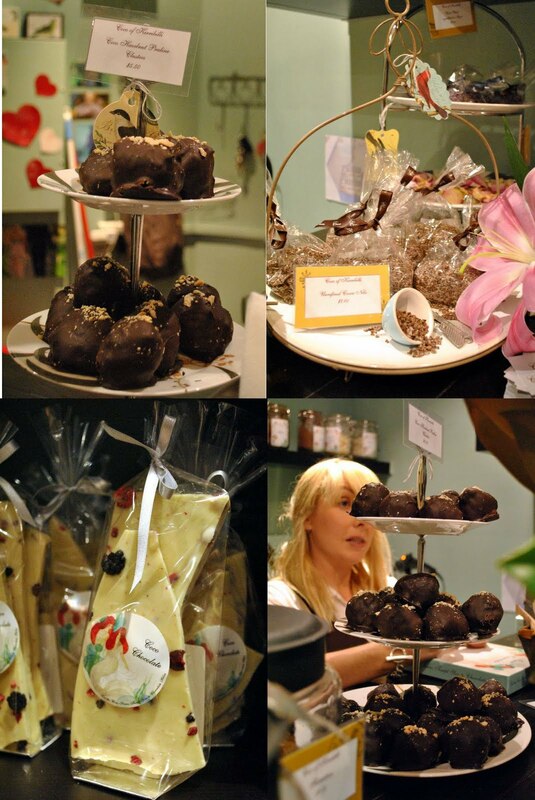 We leave well informed, filled with chocolate and equipped with a chocolate connoisseur certificates. I also buy some of the 99% chocolate and the black pepper drinking chocolate to take at home. Coco Chocolate tasting evenings ($40 pp.) are held every fortnight, but you need to book as they are quite popular. And their new Mosman store is opening at the end of July! This gives me all the more reason to visit this lovely shop. I stumbled across this store quite by accident whilst wandering through Kirribilli after lunch at Ripples. And what a discovery it was! The store is beautiful, isn't it?! What a wonderful evening you had. I mean, it's not hard when chocolate is involved. Nice to know these are on - thanks for the headsup, Maria! This sounds like such a great evening. And congrats on becoming an official chocolate connoisseur! Fascinating! Have you seen that show called Willie's Wonky chocolate factory - a guy who opens his own chocolate factory in Sth America? I've been intrigued by the intricacies of chocolate tasting and making ever since. Good to know this is around and accessible!